As I’ve done here a couple times, today I want to talk a bit about a game that came out a while ago, but one that I’ve only recently picked up: Warframe. I steered clear of it at first because I thought it was another free-to-play MOBA style game, which have never been my favorite games. But after I Datto talk a bunch about the game on his stream, and since it’s a free game, I figured I’d give it a shot. Now that I’ve played it for a few hours, I kinda wish I had picked it up earlier. Warframe, while it is free-to-play, is definitely not a MOBA at all. It’s much more like a third person action game more than anything. You’ve got different Warframe options that act as different playable characters – which you need to pay real money to unlock – and tons of different weapons too to mess with, all of which are standard MOBA trappings. The gameplay though is pretty much straight forward action/shooter. You pick missions that aren’t super long – playable solo, in a private group or matchmade – and run and gun your way through the enemies, taking care of whatever that mission’s main objective is. For a free game, the action and gameplay both feel pretty good. The gunplay is solid, with a decent variety in weapon choices; the melee combat isn’t overly punishing should you go that way, and the movement feels good and smooth. If I have any real hangups with Warframe, it’s definitely that it wears the free-to-play side of it on its sleeve. New Warframes are few and far between, unless you shell out real money on Platinum. Certain weapons are also gated behind Platinum prices. A lot of the Xbox Live Achievements are also really grindy. It’s a game that I want to really like because the gameplay is there, but I feel like it’s a game that you have to be playing as a main game. I got it as a secondary game – I’m still all-in with Call of Duty: Black Ops III, Destiny and The Division and this was a game to play when I’m a little burnt out on those three. It’s in the same spot on my playlist as Gunstar Heroes, Mega Man Legacy Collection, and this week’s Battleborn Beta. For a free game, the ROI is definitely there, and I certainly think that Warframe is a game that is worth picking up, especially with a fresh update that just went live for it. One thing that I think I’ve come to understand about my gaming habits as I continue to try to play as much as possible is that it’s very likely I’ll miss a game here and there. Over the summer so far I’ve been so focused around E3, Destiny and the new DLC for Titanfall and Call of Duty that I’ve kind of missed a few games. One of those games is the 3DS retro platformer Shovel Knight. After seeing a Rage Quit video from Michael over at Rooster Teeth featuring the game, I was much more intrigued than before – I had just heard a little of the game prior. Booting up my 3DS to find out just how much it would run me, I figured I could part with $15 to play a game that reminds me of all the old NES platformers I grew up with. After dealing with Nintendo’s not so smooth way of downloading software, I got a chance to finally play. Let me tell you, if you grew up playing any NES or SNES games, you owe it to yourself to pick Shovel Knight up. It’s a fantastic homage to the days when games were demanding without being unbearable, requiring precise jumps and attacks. 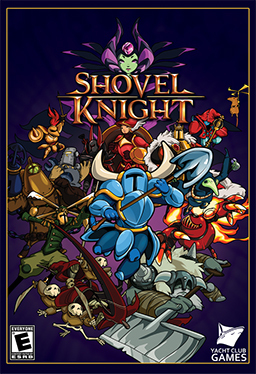 Even the story seems like it’s straight out of the early 90’s; you play as the eponymous Shovel Knight, tasked with ridding the countryside of the Order of No Quarter and the Enchantress, while trying to discover what happened to your compatriot Shield Knight. Each member of the Order has a totally different feel and theme, affecting the design of their levels, as well as their moveset. The best part about Shovel Knight to me is just how much it really does feel like an NES game. The game has a color scheme that adheres to the color palette of the NES, even using parallax scrolling, a staple from the old 8- and 16-bit days. Any gamer that played the classics knows that the look is only half of the equation – a great soundtrack really is what puts the icing on the cake with a retro game, and Shovel Knight delivers. The chiptune soundtrack sounds right off an old Capcom classic – possibly because Mega Man composer Manami Matsumae contributed a couple pieces to it. The most important part though is the actual gameplay – if it’s not there, the look and sound means nothing. Luckily, Shovel Knight plays as well as it looks. The basic gameplay revolves around platforming, while using your shovel blade to combat the denizens of the world. There’s enough depth in the combat system, with magic weapons that all have different properties, giving players a bit of customization in how they approach their battles. It’s a game that I wish I had grabbed day one, but I’m very glad that I was still able to find it.